Pomai has been blogging about food since June 2006, when he launched The Tasty Island after a particularly passionate conversation about Hawaii’s best hot dog on HawaiiThreads. The first entry, originally posted to a WordPress blog, tackled the “andadog,” in which hot dogs and andagi collide. The rest is history. Pomai rates restaurants and dishes using a “Spam musubi rating system,” assigning each a “Musubi Grade” from one (average) to five (“Broke Da’ Mout”). He moved to his own site in October 2009. 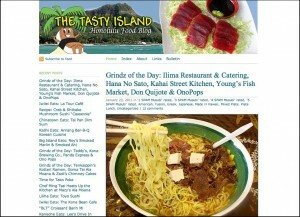 You can follow Pomai on Twitter at @tastyisland808.